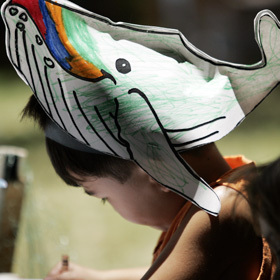 WEEKEND SCENE » Herman Hamada wore a humpback whale hat that he created in the National Oceanic and Atmospheric Administration (NOAA) booth of the E Malama I Ke Kai, an ocean awareness festival, held Saturday at Kapiolani Park Bandstand. The freighter got stuck in coral off Barbers Point after proceeding without a required harbor pilot. Future engineers experience the joy of solving problems. A feature film to be made on Molokai will expose the dangers of crystal meth through the fictional tale of one girl's tragic decline. UH's regional run ends with a 12-3 loss to host Oregon State. The club begins the summer paddling season by winning the Clement D. Paiaina Regatta. Kekela "Kela" Miller is the person in Laie whom Hawaii Reserves customers call on when they need help. Japan and Norway are hoping to remove a moratorium on commercial whale-hunting.